This (well overdue) review finds me trying to prop up one of those worthwhile albums which have gone somewhat overlooked since being released earlier in the year, as well as rounding out the third installment of cheers for that great grey puddle to the north, Washington state. I discovered the Old Haunts during a stint with college radio – an ideal time to get into a band like the Old Haunts, really. They're not original in the least, but they're the band that would easily become a staple, if only you'd give them the chance. They epitomize the minimalist mentality of their label, Kill Rock Stars, and even on Poisonous Times, their cleanest and most cohesive record, they remain loyal representatives of the DIY garage rock ethic. What's changed since the 2002-2004 recordings of Fallow Field (released 2005) is surprisingly plenty. For one, Craig Extine's voice, once merely high with shock and/or playful lack of commitment, adopted what will inevitably be called a Jack White quality during 2006's Fuel on Fire, and in watching Extine sing – the Old Haunts visited the Smell this past April – it's a helpless lisp that he seems to have taken on, his tongue actually hanging out of his mouth as he sings. It's a nag he offers, and it's an acquired taste. 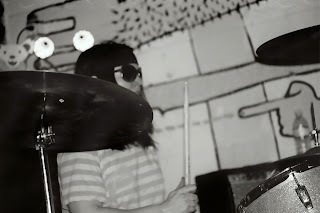 The drummers of recorded past certainly make a difference in the group's album history; Fallow Field was a collection of work featuring three separate drummers in sessions over three years, the most classic punk urgency brought to the 2004 tracks which were carried by Danny Sasaki on drums and found no guitar solo or beat lagging behind. So quick, these six songs, which quickly ran through. Though Fallow Field is a fun listen in all, it's certainly no coincidence that what seemed to be their most compatible pairing of percussion and melody was actually helped by better songs being written later in the recording process. With a more serious, slightly cleaner and less spontaneous record came a new drummer, heavy hitter Curtis James. Fuel on Fire was also a solid record with Extine's lyrics as a sudden focal point and his speedy guitar solos more audible through thinner bouts of lo-fi production. It was a good, almost angry-sounding collection with a fair amount of aggression showing through riffs of swamp, surf, pluck pluck pluck. Two years later, we've got Poisonous Times, where the band has remained loyal to Fuel on Fire producer Johnny Sangster, leaving them with that relatively clean production which still fails to spoil their natural knack for old fashioned rock 'n' roll. But this record is different in tone, and miles from where the Old Haunts were five years ago. I can't help but feel that the mood of the record is quite sad from its start, even despite the replacement of James with phenomenal multi-tasker Tobi Vail, whose drumming is heavy on the crash and snares, light on the toms (unlike James, a definite reversal). Poisonous Times is more varied and more memorable than Fuel on Fire; “Volatile” carries a lot of swing but is sung with barely mustered confidence, which finally picks up with “Hurricane Eyes.” There's a lot of spit and fury in “Sister City,” a boxy rhythm and practically inhuman strain of voice in “Ruined View,” and all of the above in “Not Hopeless,” a fighter of a track. Emo it's not, though, and Poisonous Times has, once again, got some fantastic riffs and solos – this time more surf than swamp – as well as Vail's endlessly energetic drumming, perhaps in its prime on “Outside of Divided Time,” which sees her skipping about merrily and Irishly, or “Hurricane Eyes,” on which she tumbles along effortlessly. Bassist Scott Seckington gets a bit buried at times, save for when Extine's guitar quiets down, but then, isn't that the usual case with a classic rock 'n' roll record? Purchase the whole damn thing here.